Dentist in Pittsburg, KS | My faith in humanity. Posted March 14, 2011 . This is Bryan. He is the fourth of my five children. Everyone who knows him is captivated by his smile. As a dentist, I would love to take credit for that infectious smile. I chalk it up to good genes–his mother’s! 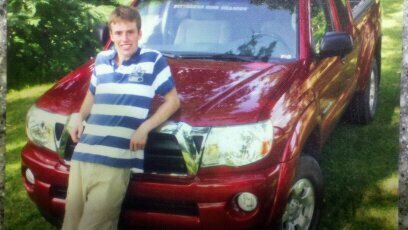 This is one of his Senior pictures. He is a 2010 graduate of Pittsburg High School. He played football his freshman year, ran Cross Country his sophomore through senior year, ran track sophomore through senior year, and played basketball all four years. He loves life, and is respectful of it–as much as a teenager can be. I remember being his age many years ago and feeling invincible. Like many people his age, he also has that tendency. He loves his truck! I have always considered myself an adequate parent. I never felt worthy to receive the “Father of the Year” award. Maybe ‘Better than Average Father” award would be mine some day. This weekend has caused me to really think about life and what is truly important. There come times in our lives when we think about things–the deep “meaning of life” things. I had one such experience recently. Mine began late Friday night. While I was out picking up my daughter from her babysitting job at midnight I received a call. I have always heard that as a parent, midnight calls can never be good. Bryan had been in an accident. The details were sketchy, but the best I knew at that point, it was a roll over accident. 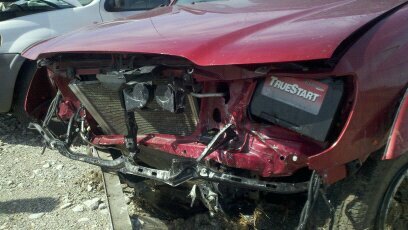 I went to the scene of the crash and found that red Toyota truck you saw in the above picture, in the ditch. It was upright, and the top was in good shape, so no rollover was evident–thank goodness! (Or so I thought). 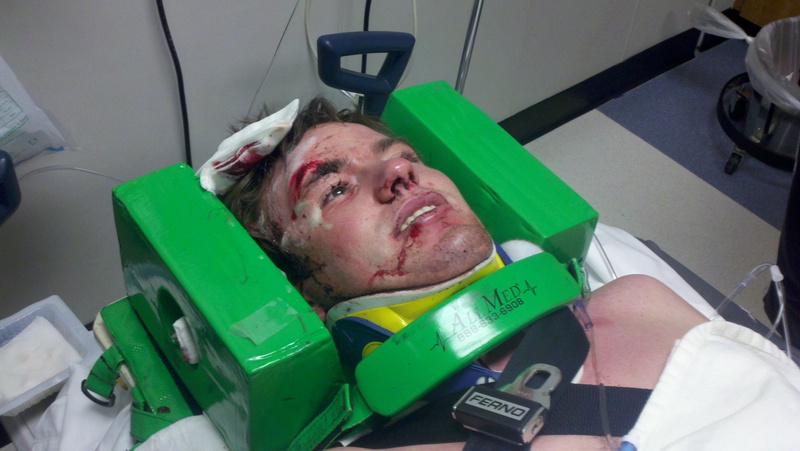 Bryan was being strapped down to a board and his head and neck were being braced. That is a scene no parent ever wants to see. Trust me on this one! Now, I don’t consider myself a materialistic man, but I could not help but think that maybe I failed to teach that to my kids. Note to self–teach your children the things that really matter to you. After the situation was stabilized, I took a walk around the accident scene and tried to imagine what really happened. It was dark, and so I could not see everything, but a couple of days later, I went back during the day to see what Bryan hit to cause the crash. He reported seeing something dart out in front of him and the next thing he knew he had stopped. At sixty miles per hour, a concrete wall will cause a lot of damage when it is hit straight on. 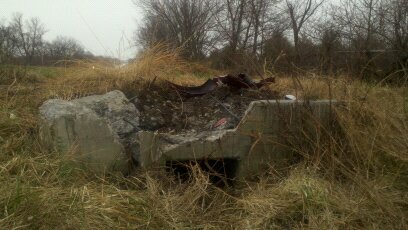 As best I can tell, he hit this culvert. It essentially shattered. He finally came to a stop about 30 feet beyond it. Shattered concrete and rebar was everywhere–even at the place where his truck finally stopped. 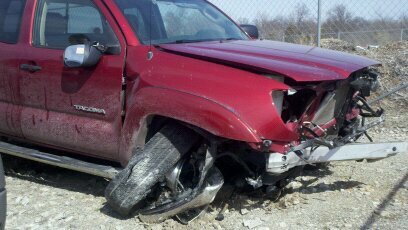 His beautiful truck was a mess. At the Via Christi Emergency Department, a CT scan and X-rays showed 2 fractured vertebrae and no other broken bones. His face was stitched upand he was admitted into the ICU. The next day he was transferred to St. John’s Regional Medical Center in Joplin, MO. Dr. Brian Curtis, the neurosurgeon, reviewed the digital CT scan and the x ray and confirmed the fractures. He assured us there was no immediate concern for major problems like paralysis. An MRI was performed and confirmed no major problems. The small fractures would heal over time and Bryan would make a complete recovery! The best news ever!! I must make a confession here and now. I am a social network lurker (that is less threatening than a stalker, right?) On Facebook and Twitter, I read the posts and tweets of others. It is as though I can peek into the lives of my “friends” and those I “follow”. This weekend, I broke with that tradition. I broke my silence and posted about Bryan’s accident. I did it at his request; so his friends could stay updated on his situation. In the process I received an unexpected benefit. I never sought it out, but it came nonetheless. I am sharing this experience because I have re-learned that we all need each other. My friends on Facebook expressed concern for my family and me. They offered prayers on our behalf. I felt their strength. I benefited from their faith in God. My local friends all banded together. Dinner was sent over on Bryan’s discharge day. We did not “need” it, but I came to realize that by allowing it to happen, I was allowing a concerned person the opportunity to serve and be bless by God for that service. I am thankful and will always be. My faith in humanity bumped up a few notches. So, to each of you, I express a heartfelt “Thank You” for helping me become a better person. You helped me learn (and re-learn) some very important lessons; and because of you, who knows, maybe I will have a chance at that “Father of the Year” award in about 125 years!! Go out and do your part to make this world a better place. Remember to treat each person you meet as though they are in the middle of a struggle, because there is a good chance they just might be.